This time of the year, the corridors of Rail Bhawan on Delhi’s Raisina Road, would normally have been abuzz with activity as officials would be at work tightening the nuts and bolts of the railway budget. The exercise was so time consuming, officials would have to sometimes go without sleep. The effort was to cover every microscopic detail of new trains, projects and railway lines. But now, Rail Bhawan mandarins are no longer spending sleepless nights as the union government on September 21 decided to merge the railway budget with the general budget. The finance minister will now present a unified budget, breaking a 92-year-old tradition of having a separate railway budget and bringing an end to this British era legacy. The union budget will be presented on February 1, 2017. A high-level team that used to take over a month’s time to prepare a 50-plus-page detailed speech for the railway minister will now have to ready highlights that will be squeezed into just two pages. A single Appropriation Bill, including the estimates of railways, will be prepared and presented by the ministry of finance to parliament and all legislative work will be handled by the finance ministry. Senior railway officials told Governance Now that the major responsibility of preparing the railway component of the budget lies with the finance ministry. However, railway officials are helping officials in the finance ministry with the work. “Since it is the first year following the merger of the rail budget with the general budget, we are taking some time to get a grip, but next year onwards, things will be smooth,” said a source in the finance ministry. A high-level team is at work helping the finance ministry, and it includes staff of the railway minister, the executive director (budget) and additional member (budget). The idea of merging the rail budget with the general budget was mooted by a panel headed by economist and NITI Aayog member Bibek Debroy in an effort to restructure the railways. The NITI Aayog had sent a 20-page note to the prime minister’s office (PMO). The note, titled “Dispensing with the Rail Budget” argued that the budget preparation and presentation exercise had failed to be of use to the sector. “The railway budget became a mechanism to announce popular measures, new trains, new routes, new rolling-stock manufacturing factories, etc, with no concomitant focus on addressing the railways’ structural requirements, implementation of the ‘grand’ announcements, or funding needs,” the Indian Express cited from the note. The practice of having a separate budget for the railways was kicked off by the British in 1924 as huge sums of money were then spent on the railways. The British separated the rail budget from the general budget after receiving a recommendation from a panel headed by British railway economist William Acworth in 1920-21. The railways then accounted for nearly 70 percent of the total budget. But now, the railway budget is merely 15 percent of the total union budget, said a report in Employment News. No country in the world has a separate rail budget, but in India this practice continued even seven decades after independence. One of the biggest advantages of the merger for the railways is that it will not have to pay a whopping dividend to the government of India. The railways will save approximately Rs 9,700 crore annually, which after adjusting with the subsidy in payment of dividend would give a net benefit of around Rs 5,000 crore to the railways, according to a PIB release. It adds that the capital of the railways, estimated at Rs 2.27 lakh crore, on which annual dividend is paid will be wiped off. Besides, the railways would continue to retain its functional autonomy on fares, tariff revision and delegation of financial powers. The sanctioning power of the railways will remain the same as earlier, which implies it can allocate funds to all essential projects across the board. Tariff revisions will be undertaken by the rail development authority (RDA). The railways will also have autonomy in announcing new projects, trains and expansion. “This is a major decision in favour of the railways, as it will not be controlled by any other ministry, and can work with enough freedom. The ministry will continue to function as a departmentally run commercial undertaking,” said an official on condition of anonymity. 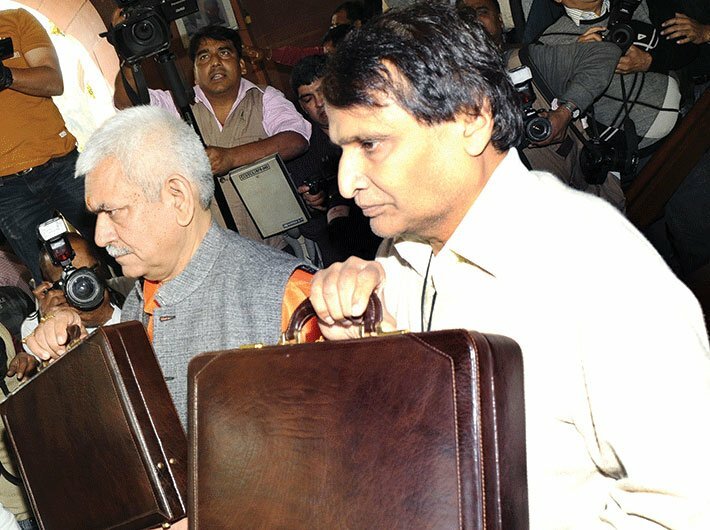 Sources stressed that the single budget would bring the railways to the centre stage and present a holistic picture of the financial position of the government. While addressing the Economic Editors’ Conference on November 11, chairman, railway board, AK Mital said that it is a simple merger and has no adverse impact on the railways. “We will not have to pay any dividend to the government, which is a big leap towards developing railway infrastructure in the country,” he said. “The finance ministry will provide gross budgetary support to the railways towards meeting part of its capital expenditure,” Anil Saxena, additional director general (PR), ministry of railways, told Governance Now. Another official, who didn’t wish to be named, said the biggest benefit for the railways is that the constant pressure for running more trains and having more stations – unmindful of the economic and technical feasibility – will be reduced. But, there are some who are not happy about the decision. Former financial commissioner, railway board, AV Poulose expressed dissatisfaction over the merger. “It’s not a good decision because the railways is not a revenue earning department, like the income tax. Irrespective of the fact that the government is saying that autonomy of the railways will remain, I strongly feel that it is not so. There will not be full independence with the railways as it used to be,” said Poulose.